Jan Foster (Hoylake & Meols In Bloom) has been researching the history of an imposing house on North Parade that goes by the name of Grebnul. It transpires that Grebnul and the adjoining semi were built on behalf of the Liverpool brewing magnate Robert Cain for his daughters. 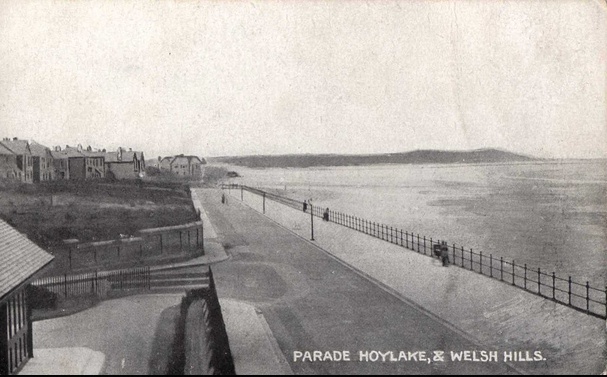 I’ve featured Robert Cain before as he had at least one other house built in Hoylake on Meols Drive …read this interesting article to find out more. Why is the house called Grebnul? Apparently the name is Lunberg spelt backwards. As reported (pdf) in the London Gazette in June, 1915 a Mary Elizabeth Lunberg of Grebnul, Hoylake, changed her by deed poll to Mary Elizabeth Langdon. Here’s an old image that I received from Jim O’Neil recently, showing the land to the front of Grebnul, the former shelter that was next to the original lifeboat station (shame that’s still not there for sheltering from stormy weather while looking out to sea) and in the distance what looks like a building that must have been right at the corner of Kings Gap and the prom? Anyway, if you have any more information about Grebnul and especially any old photos, feel free to leave a comment or get in touch. I wonder how many who read this will own up to jumping over the wall and playing in the gardens of this house. Must have been one of the best places to play all our childhood games. Funny how we never got in trouble as there never seemed to be anyone home. Defo remember playing in Grebnul gardens during the 70’s. We used to go down there to see the miniature ponies and play with the newts that would be in the pond…..I have often wondered how the developers got permission to build on the site of the auld rope factory eith what I would presume was a protected site for breeding newts!!?? I also remember climbing inside the cast iron gate posts when hiding during a game of ‘blocky’!! Good days…me (pete stacey) nicky shepherd, nicky laughton, warren and tommy brennan!! I remember when I was around 9 or 10 in the early 70s, I had a friend, Graham Gartside, who lived a few houses away in Alderly Road, we played in the garden of ‘Lunberg’ often. Climbing the ‘cliffs’ and exploring the cave, for some reason there was just an old cot or playpen in the cave, never anything else and we never saw any signs of life in the house. When you were small, the ‘cliffs’ in the rockery seemed quite a climb! Remember it so well- Grebnul, the shelters the whole area. We grow up on the opposite side of the road to the Gartside brothers. Glad Jan has done some proper research. With reference to Grebnul, it is probably the house referred to in the Parish Register of St Hildeburgh’s Church, which records that, on December 6, 1899, Arthur Laird St Clare Byrne, naval architect, bachelor, aged 28, of 12 Cable Road, Hoylake, son of St Clare John Byrne (also naval architect) married Gertrude Amy Cain, aged 25, of Marine Parade (probably the former name of North Parade), daughter of Robert Cain, brewer. That was the first wedding to be solemnised at St Hildeburgh’s, which was consecrated on September 21, 1899. The book, St Hildeburgh’s: A History and Guide to the Church and Parish, illustrated in colour, is available at the church, which is open frequently, at the recently-reduced price of £2.50. If anyone know details of St Clare John Byrne Naval Architect mentioned by Peter 14 Dec 2013, I would be grateful. I’m doing some research on one of the yachts he designed. 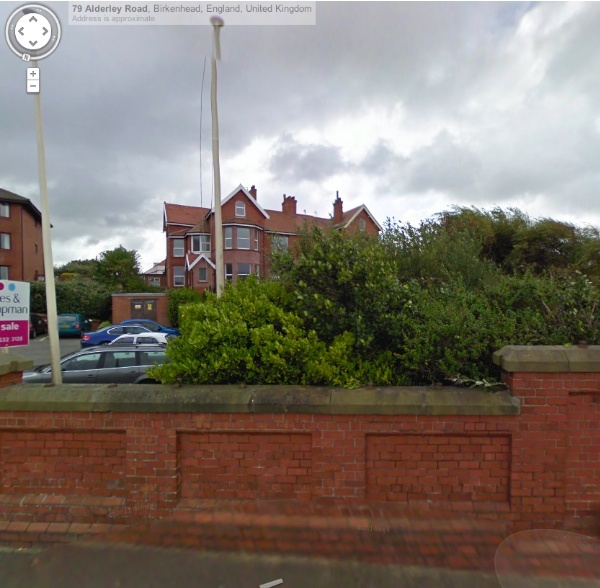 His office could have been “Normanhurst” Hoylake and certainly he was in 48 Castle Street, Liverpool for many years. Some details of his life are now on http://www.gracesguide.co.uk/St._Clare_John_Byrne. There is also a link to Arthur with just a couple of entries. I played in the grounds of Grebnul with a friend Philippa in about 1964-65. She lived in Breakwater in Marine Road. I never remember seeing anyone there, it was a brilliant garden for playing escaping prisoner of war games always on guard for the ‘Jerries’ from my memories. Ted’s post is very interesting- while I can’t add anything of substance – I just know the whole history of Grebnul and the adjoining property and of the Cain family is fascinating. I was very privileged in April, to be shown round Grebnul and to see the work Mike Foster is doing. The view from the front of the house is truly amazing and possibly the best on Wirral. I hope next year to catch up on Mike’s progress. I discovered a bit more: St Clare John Byrne had three children, Arthur, Henry and Leonard who died in his childhood. Henry married an American lady -Artemisia Desdemona Burtner-and their only child was Muriel St Clare Byrne who became a well respected historian on the Tudor period. She is now best know for her research on the 3000 odd letters of Arthur Plantagenet, Viscount Lisle. She spent 50 years on this project and it took funding from many wealthy people including our Queen to pay for the publishing of the Lisle Letters. The six volume set would cost you over £300 from Amazon. Muriel and her mother went to live with grandfather after her father had died in 1905. 1911 census indicates that they lived at a house called Glencairn, The Kings Gap. Muriel said grandfather “was a bit of a genius but never passed a speck of it onto his sons”. All three of the St Clare Byrne men were keen golfers and appears they were members of the Royal Liverpool Golf Club. St Clare John Byrne was buried in Hoylake Parish Church 14 December 1915. Does this still exist? For redraw in my next book on yachting history. St Clare Byrne drawings would be great, but I have struggled to find these. National Archives, Wirral Archives, etc. As you will know Ward Stanton was a ship builder on the banks of the Hudson in America so you may need to point your search in that direction. Namouna was a famous yacht in America (and around the world) so you may be lucky. If Gordon Bennett’s papers were placed in a museum or still in the family there may be some hope of the drawings. I found some drawings for another of St Clare Byrne’s yachts (Portia) in a library in Bradford with the help of local researcher so there is a chance. Forgot to mention that Somerville College Oxford have some papers of St Clare John Byrne’s granddaughter Muriel and I hope to visit the college in the new year and view these. They are not catalogued at the moment, and from the description given to me by the librarian, they do not include drawings. However, there may be some family history. I will let you have details once I have seen the paperwork, although I am not sure if they will let me copy any items of interest. Do you have an email address I could use? V378 Nooya – ref: 5/271/11 specification details and correspondence. V538 Norseman – ref: 5/274/12 specification details and correspondence. There are some unconfirmed reference to say that he was involved with the design of the Confederate Raiders possibly Alabama – Laird Brothers vessel V290. Byrnes older brother, A E Byrne, was a shipping merchant at this time and involved in shipping goods to Nassau – one of the launching off points for the blockade runners during the American civil war. On the final trial run of Alabama (before she made her dash for the open sea) one of the guests was an A E Byrne, but this may be a co-incidence. This report came from one of the Union spies watching the ship’s construction. You may know that there was a lot of sympathy for the Confederate cause in Liverpool during the American civil war.